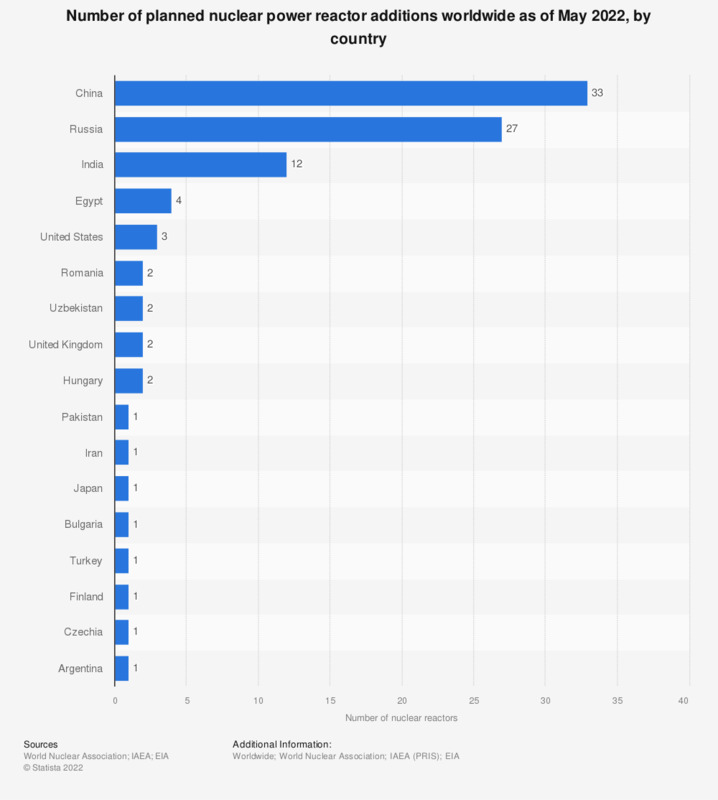 This statistic shows the number of planned nuclear reactors worldwide as of April 2018, by country. There were four nuclear power reactors planned in Iran. The Bushehr Nuclear Power Plant is the first nuclear power plant operating here. As of April 2018, China and Russia have the largest number of planned nuclear reactors, totaling 41 and 25 reactors, respectively. Globally, both countries have a relatively high number of functioning nuclear reactors compared to other nations. In April 2018, the United States reported the highest number of functioning reactors, namely 99, followed closely by France with 58 reactors. In 2015, almost 77 percent of France’s electricity production was generated by nuclear power. About 40 percent of France’s population believes that nuclear energy use has more disadvantages than advantages. Formerly called atomic piles, nuclear reactors are used to start and control a nuclear chain reaction in power plants. The heat from the reaction is transferred to a working fluid which in turn, runs through turbines for both electricity generation and ship propulsion. Nuclear reactors can also be used in the creation of isotopes for medical or industrial purposes, as well as for weapons production. Early efforts to prevent nuclear proliferation began with government secrecy and have since evolved under the International Atomic Energy Agency founded by the United Nations. Nuclear reactor construction was much more widespread in the 1970s and peaked in 1976, when 42 reactors were being built globally. In 2016, there were three nuclear reactor construction starts worldwide. As of 2016, almost 80 operating reactors around the world have been running for 40 years or even longer. * According to the source, planned nuclear reactors are approvals, funding or major commitment in place, mostly expected in operation within the next eight to ten years.